New products to end your motors fuel and engine carbon residue and friction related problems. Here are 5 categories of fuel additives that work. They will narrow down what to use to get your car or truck running great again. This is probably the most complete fuel treatment in the market place. To be complete, a fuel treatment must do more than add a lubticant to the fuel. This are features in our fuel treatment. Neutralize acids. Keep fuel from souring. Absorbs moisture. Reforms sludge back into its former burnable state. Enhances combustion. Cleans fuel injectors and carburetors and combustion area. Works in any type fuel. Lubes rings and valves. Enhances starting. May end stalling, hesitation rough idle. Add to fuel monthly. 2 oz #93 to each gallon fuel once a month. Shipped to your door in about 3 days. $12 each 12oz +$5s&h=$17 total. Order by 6 pak. $50 plus $10 shipping. $60 total. Save $40. Diesel Treatment #5 is a fuel conditioner. To be complete, a diesel fuel treatment must do more than add a lubricant to the fuel. This brand does! Features also includes: Neutralize acids. Keep fuel from souring. Absorbs moisture. Reforms sludge back into its former burnable state. Enhances combustion. Cleans fuel injectors and combustion area. Anti-gel. Algae killer?. Stops black smoke under load. Replaces surfer as a lube. Lubes fuel pump, rings and valves. Treats 12 to 25 gallons. Add every monthly. [Use 24oz in 25 gallons to clean dirty injectors, as you drive]. Shipped to your door in about 3 days. Just $12+ $5s&h= $17 total. 6 pak, $36+ $10s&h= $46 total. 24 pak 12 oz. Just $120 plus $15s&h=$135. Save $100. One Gallon Mega Power Diesel Fuel All Purpose Treatment. Shipped to your door in about 3 days. $60 gallon + $10s&h= $70 total. 6 gallons $150+ $25s&h= $175 total. Save $200. Neutralizes acids. For vehicles not driven regularly, and for vehicles in storage. Keeps fuel fresh for easy starting. Anti-rust. sit for months. Keeps fuel fresh. Easy starting. Can be driped into the carburetor throat to instantly clean the bore and air bleeds - and pvc valve circuit, with motor running. $12+$5s&h=$17 total. 6 pak $60 total. Free shipping. Cleans dirty injectors and combustion area as you drive in one day. Smooths rough idle, ends stalling, restores lost power. The strongest, safest, fastest acting cleaner available. Use in fuel rail devices to clean dirty injectors instantly. Or add to fuel tank to do so. $22+ $5s&H=$27 total. 6 pak $72 Total. Free shipping. Cleans dirty injectors, the combustion area , and the oiling system Lowers emissions. The complete engine chemical tune up as you drive in a few miles. Smooths rough idle, ends stalling. Tip: Use with any repair to correct problems new parts cannot for a horsepower gain customer love! Easy to follow instructions. Phone help on install if needed. fast acting. Shipped to your door in about 3 days. Just $65 plus $10 shipping. Total $75 for the 3 pak. Dealer charge can be over $250. Fuel additives that work better! The Mega Power Engine Tune Up Treatment is a great combustion cleaner that also cleans all 6 sub-systems of your motor. Each ingredient ends performance-causing problems in the specific sub-system, and this approach restores great like-new motor performance. Cleans dirty injectors and combustion area as you watch. Smooths rough idle, ends stalling. The strongest, safest, fastest acting multi-area cleaner available. Contains MC+. Fuel additives that work - include wear reducing ingredients. Mega Power's MC+ are two known friction modifiers found to properly end the wear-out process and maintain surface smoothness on pistons, bearings, valves, and gear surfaces. Mega Power's MC+ ingredients re-induces smoothness to wear roughen surfaces so motor and transmission parts pprovide clean and trouble-free operational enjoyment. 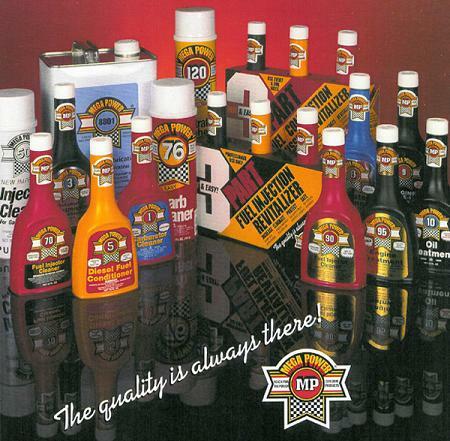 Included in all Mega Power Products to be added to oils and lube fluids. Great for older, worn motors and transmissions, operation. too. The Mega Power Engine Tune Up Treatment ends oil burning, tapping, leaks, rough idle,Engine Tune Up Treatment and power decline. Helps worn motors run as good as when near new again. One Mega Power Engine Tune Up Treatment $ 65+ $15s&H= $80 total. Two Treatments $120+ $15s&h= $135 total. Save $35. Six Treatments $300+ $15s&h+ $315 total. Save $180. While our gas and diesel fuels are the best ever, they do not always hold their own in the grueling day-to-day conditions they must go through. That is when you need a fuel additives that works! Some fuel additives have a cleaner as a major ingredient. Some have several ingredients that work. Several is better! Some are of poor quality and do little good. Fuel additives that work should work equally well in cars, and trucks. I like products from Mega Power, as they have advantages to end fuel, filter, fuel pump, fuel injector, idling, intake, combustion, and exhaust problems - in cars, trucks, and equipment. "Hot or cold, my older 99 Chevy once again starts up fast. It runs smooth again, the tap is gone, and has the more power. You were right! It was a sticky valve problem and you product end it." "Your Mega Power Treatment picked up a good 40 more miles driving distance between fill ups. It stop the nasty drip on my drive." They restore the like new performance you need - regardless of age or miles, or hours on them. That makes them the "best of the best!" If you find they don't work as advertised, your money refunded. We go out on a limb with that guarantee. Few ask for one because these fuel additives work as promised.